Kanbawzathadi Palace is the must see place if you are a fan of majestic palaces and royal constructions. It is located in Bago city, the old capital of Myanmar which is less than 2 hour drive from Yangon. 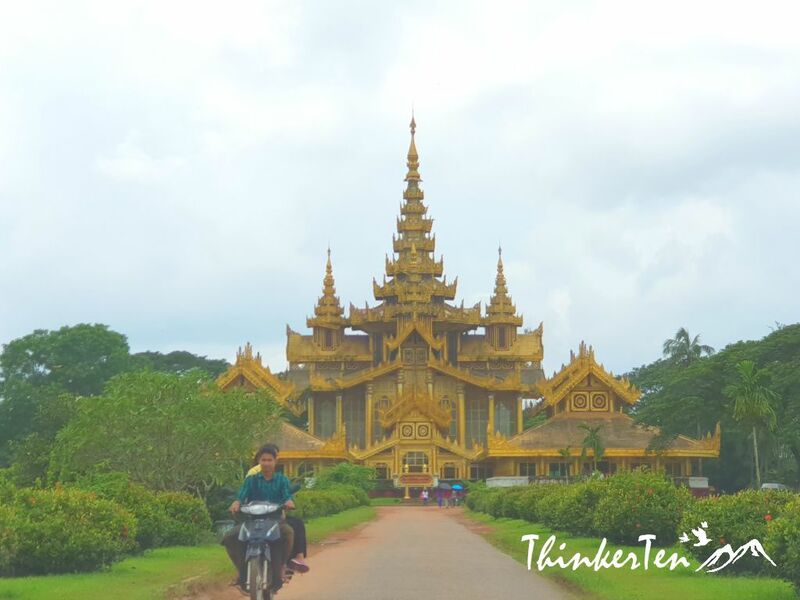 If you are visiting Yangon, Bago is highly recommended for a day trip and there are few important sites beside this palace. A pair of giant Chinthes was seen displayed at the gate of the Palace when our private taxi drove near to our destination. Chinthes are often seen outside the pagodas & temples throughout Myanmar. You also see Chinthes in Thailand & Cambodia. Similar to the Chinese guardian lions/石獅 for protection purposes. I was indeed quite excited as I have been seeing too many pagodas and stupas so it is a good break to see something different. 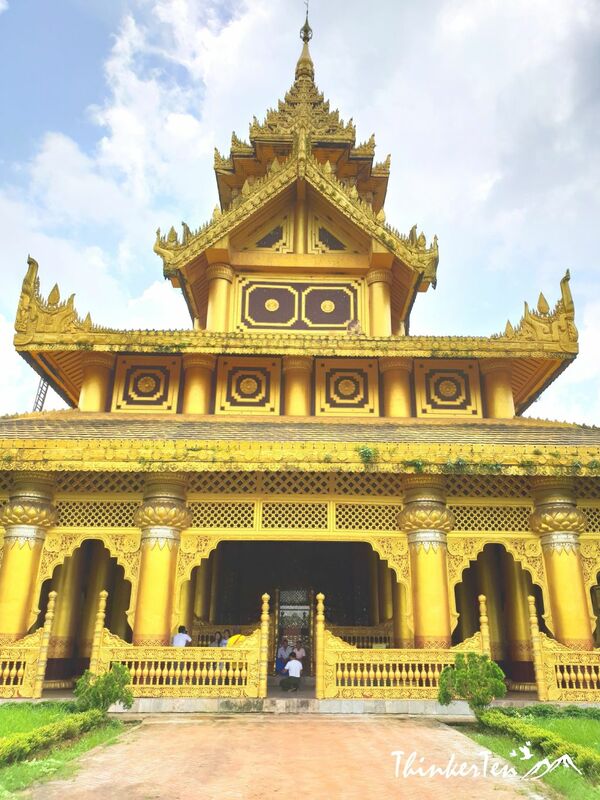 The Palace was painted with gold color so it is also known as the Golden Palace. The Kanbawzathadi Golden Palace complex has two main buildings. The main one is the Golden Palace which was built in the 16th century but was destroyed due to fire and war. Things inside were being looted. But luckily a replica was built in 1990 which look identical to the original palace. The original palace was built during the successful time in Burmese history by the famous King Bayinnaung who conquered Ayutthaya in Thailand (Ayutthaya Ruin is less than an hour from Bangkok Thailand). There are several pictures and artifacts when you entering the palace hall which gives us some history lesson of this place. 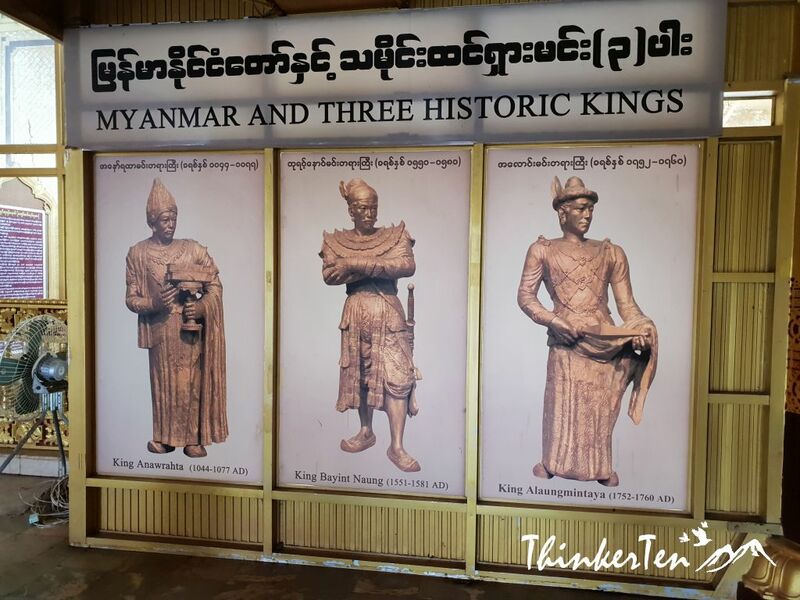 King Anawrahta – The first king for Myanmar who introduced Theravada Buddhism. He also united the northern part of Myanmar with the Mon Kingdom of the south. King Alaungmintaya – He is considered one of the three greatest monarchs of Burma/Myanmar alongside Anawrahta and Bayinnaung for unifying Burma for the third time. The hall look grand with giant pillars all painted in gold. You are able to see the original teak wood used to build the palace which were mostly destroyed and burnt which were placed next to the new pillars. 167 teak pillars were found, 135 of which are inscribed in Mon language with the names of towns, regions and people who donated them to the palace in the 16th century. This is the place for the King to meet his ministers. Once upon a time, this place has 9 Royal Thrones, each of them was used for different occasion and in different style and design but due to the fire in 1599, most of the thrones were burned down, except for the Lion Throne here. If you see clearly, there is lion figures carved on it. 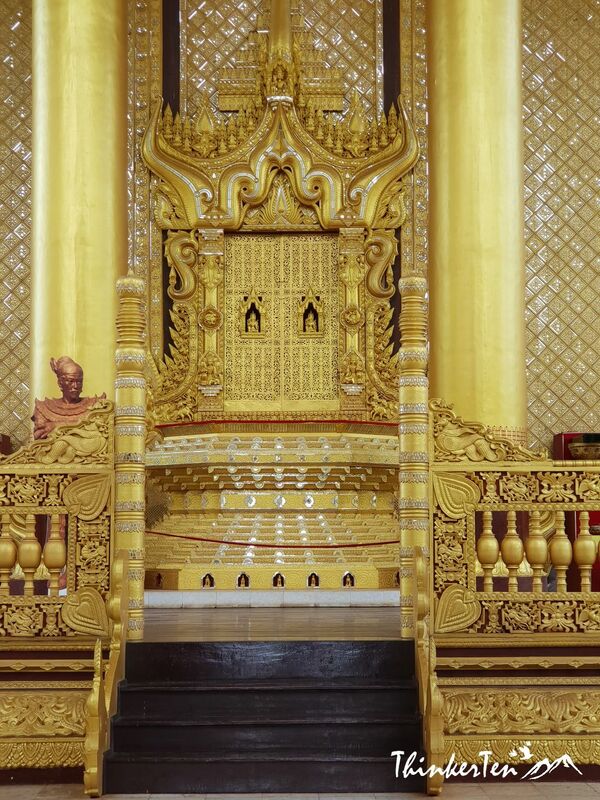 The real throne is exhibited in the National Museum of Myanmar in Yangon. You can go behind the throne and walk one round but it is quite dark. Bagan Period, Hantharwaddy Period and Konboung Period. This is a private quarter for the King, you are able to see the Royal bed chamber and living chamber. Again, it is a bit dim inside. You can count the 7 layered roof top known as “Pyatthat” usually incorporated into Burmese Buddhist and royal architecture. Such style of roof top are prominent feature in the royal buildings which symbolized Buddhist heaven. 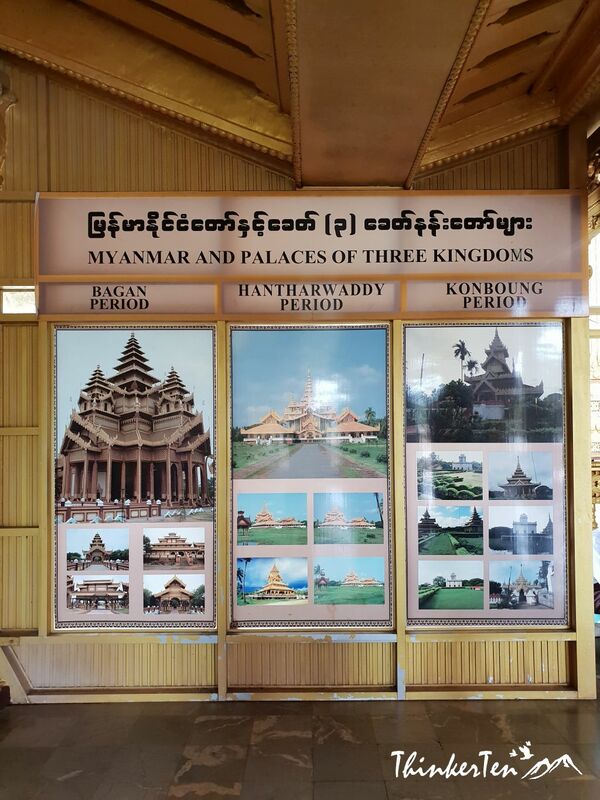 Included in Bago archeological zone ticket at US$ 10 or 10,000 kyatt for 4 attractions in Bago. 9am to 5 pm daily except Burmese national holidays. 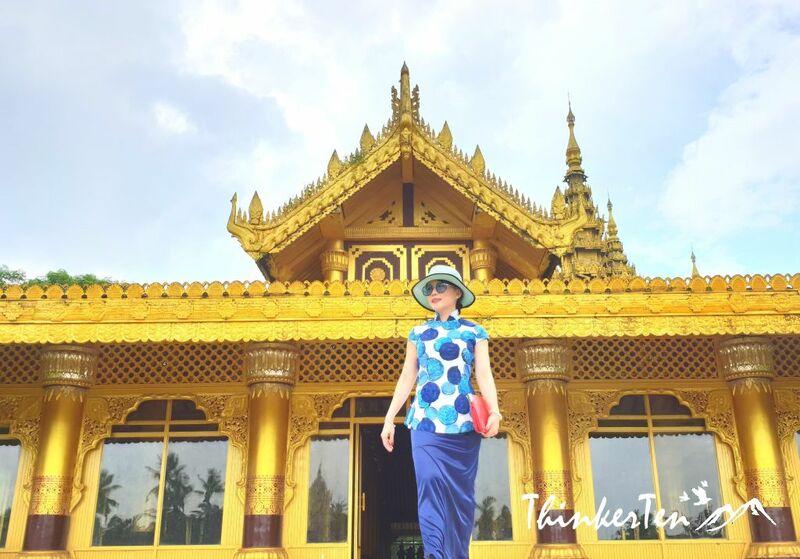 Even though Kanbawzathadi Golden Palace is the replica, it is still worth to visit to see the stunning Burmese architecture. You can use your imagination to visualise how it looks like in the 16th Century. Plenty of photo opportunities outside and inside the palace. 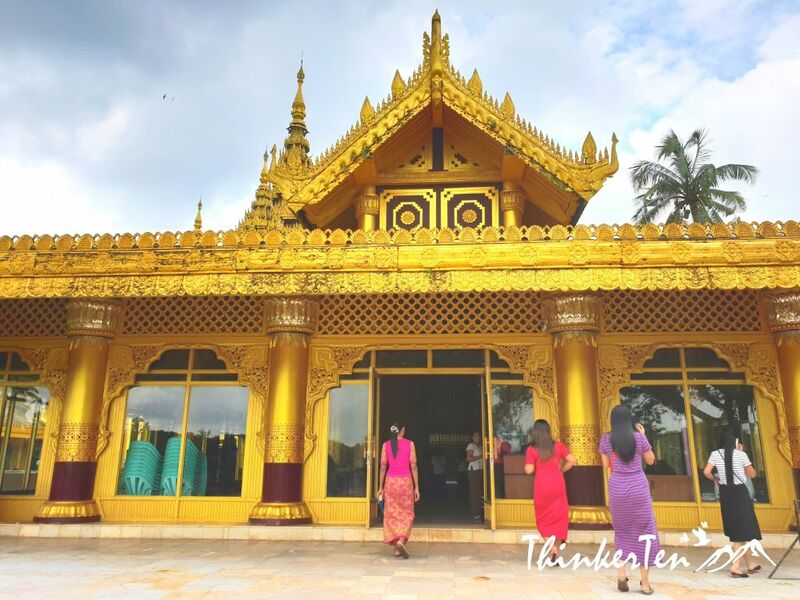 The Golden Palace is located in a huge park and locals especially couples love coming here for photo taking and courtship. An hour is enough to explore this palace. Yangon : Raining outdoor, no problem! Go visit the 5 storey National Museum of Myanmar! What a truly beautiful place the golden palace is. I just love the architectural design as well as the incredible detailing on the building’s interior and exterior. Would love to visit someday. You can count the 7 layered roof top known as “Pyatthat” usually incorporated into Burmese Buddhist and royal architecture. Such style of roof top are prominent feature in the royal buildings which symbolized Buddhist heaven. Truly stunning. If you goal is to visit the world, then Myanmar in Asia is one of the must stop. 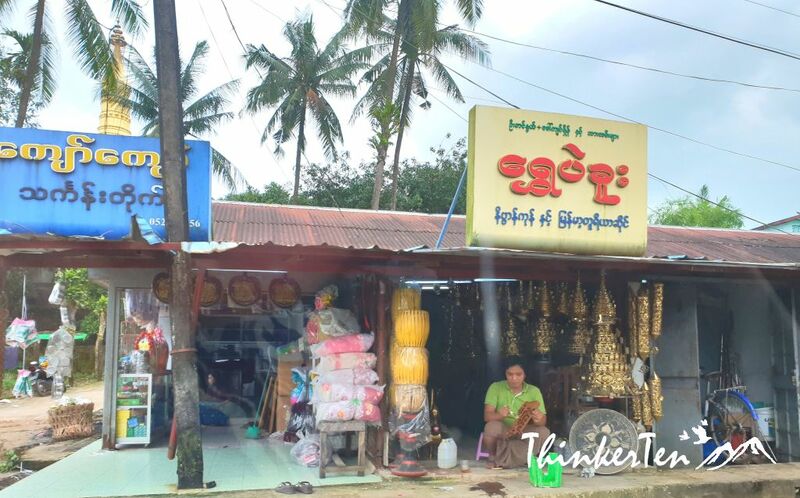 There are plenty of temples and pagodas in Myanmar and things are also cheap. Woah what a beautiful city! This would be an amazing place for my family to visit! 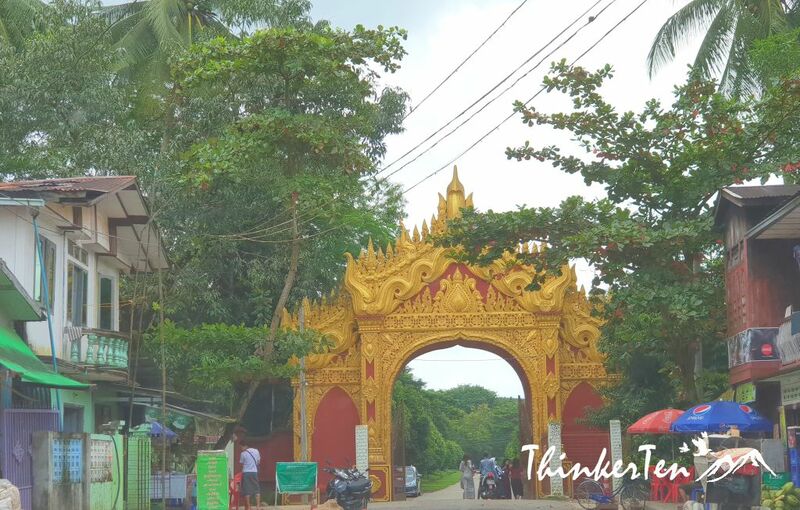 Bago is an interesting historical old town which is about 2 hours drive from Yangon city. Beside the Golden Palace, there are few interesting sites around this area. Most people do a day trip from Yangon as the hotel in Bago town is not that great. Everything about this place is beautiful. I would love to visit there one day. There are plenty of photo opportunities in this area as there are two portion in this park. I never been to Myanmar but it is on my bucket list. What a beautiful Golden Palace! Stunning architecture and detailed design. By the way, love your outfit so pretty! Thanks for your comment and glad you love my outfit. 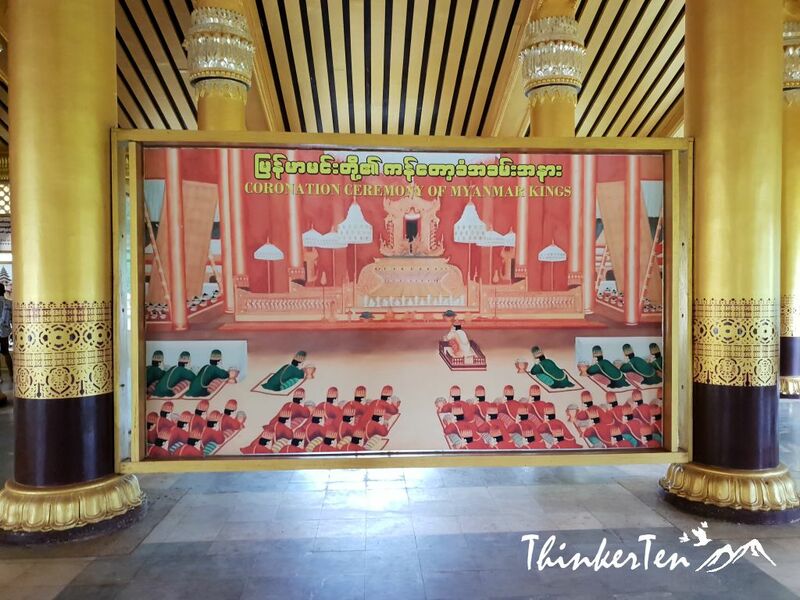 Sleveless and short skirt is not permitted in most of the temples in Myanmar. So I have to purposely wear a top on top of my sleeves blue dress. I agree the architecture is stunning even though it is a replica palace as the real one was burnt down. Wow! So amazing! I have visited Thailand many times but Myanmar is on my bucket list. Will definitely pop-in on my next visit to South East Asia. Thailand and Myanmar share similar culture as both are strong believer in Buddhism however their food are slightly different. I perfer Thai food which are sour, hot and spicy. Monhinga is the national breakfast in Myanmar and you have to try if you are in Myanmar. I tried Monhinga but don’t really prefer it as the soup base is too sticky for me and contain some chickpea which I am not use to. A very beautiful place! Myanmar has never been a place on my must visit list, but after seeing these pictures I think it should be. 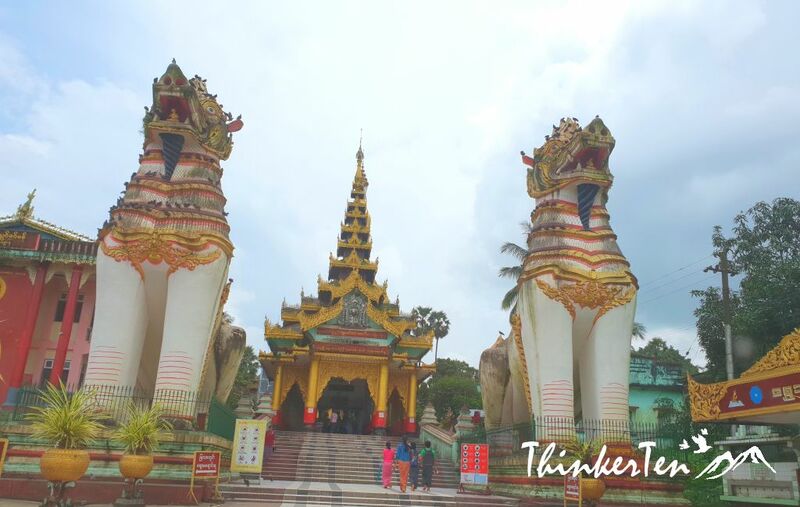 There are plenty to check out in Myanmar, the friendly local, the pagoda, the temples and lastly the backward cities. One of the least developed countries in Asia! 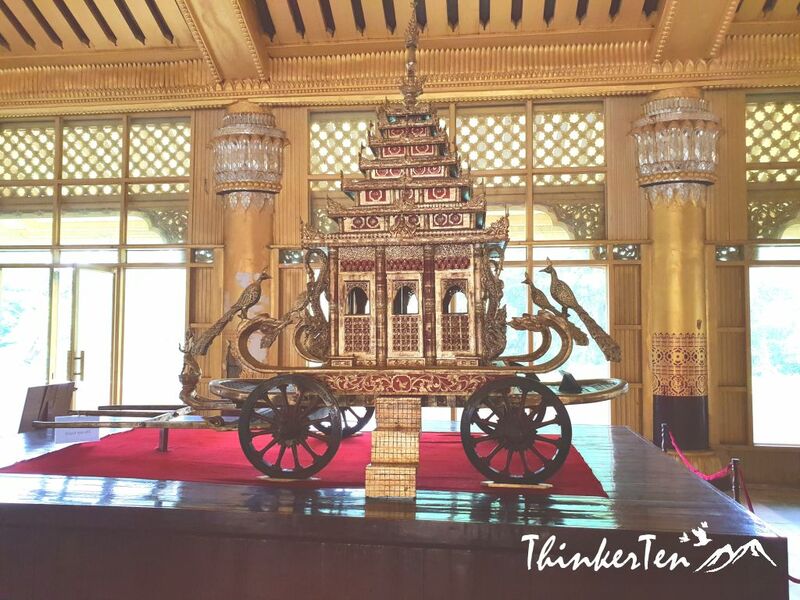 Though this palace is reconstructed, it is still beautiful with gold painted decoration, big teak timber and remaining teak posts for building palace brought by lesser kings to great king Bayinnaung. We can see many teak post on them names are describing with ancient myanmar alphabets. 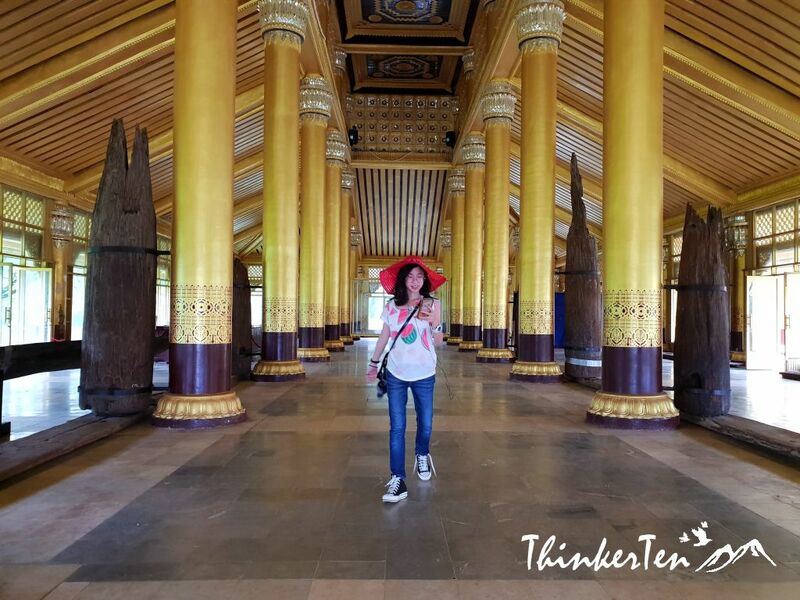 The teak timber in the Golden Palace are still the original from the ancient time. It was placed beside the new one. You are right, you can see many teak with names with ancient Myanmar alphabets too. Wow this is seriously absolutely stunning! Would love to visit and actually see in person, it is just so gorgeous. 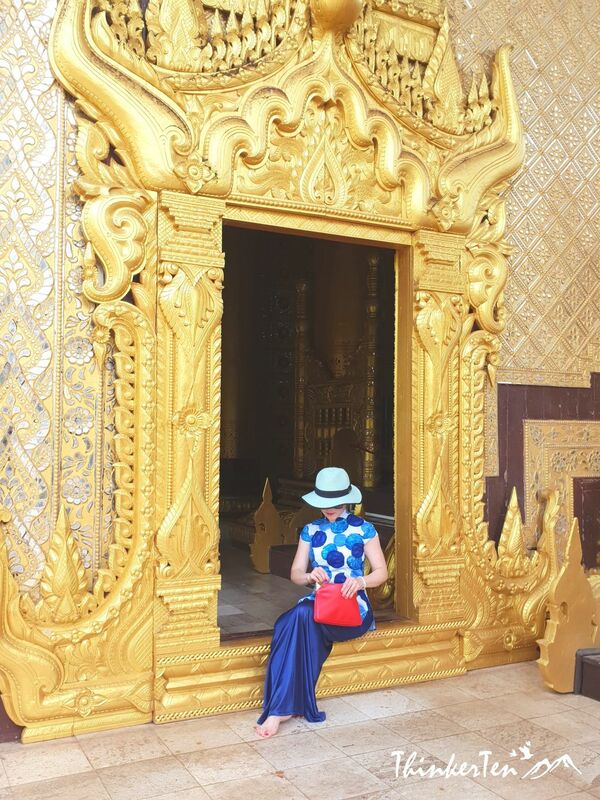 The Golden Palace look stunning from all angles and plenty of photo opportunities. When you enter the palace, shoes needed to take off. The architecture is fascinating! It’s a shame that the original was burned down, but it’s great that someone saw the importance of history in it and rebuilt it. Yes, I guess it is better than none, so the replica is not a bad idea to learn about the past. Thank you for your comment. The Royal Lion Throne hare are also replica, we saw the real Royal Lion Throne in National Museum of Myanmar in Yangon. The throne look really stunning! I have never been to an actual palace before. The architecture and decor are stunning and you look stunning too! Fabulous photography as well! Wonderful post! Myanmar has just opened up after 50 years for tourists. 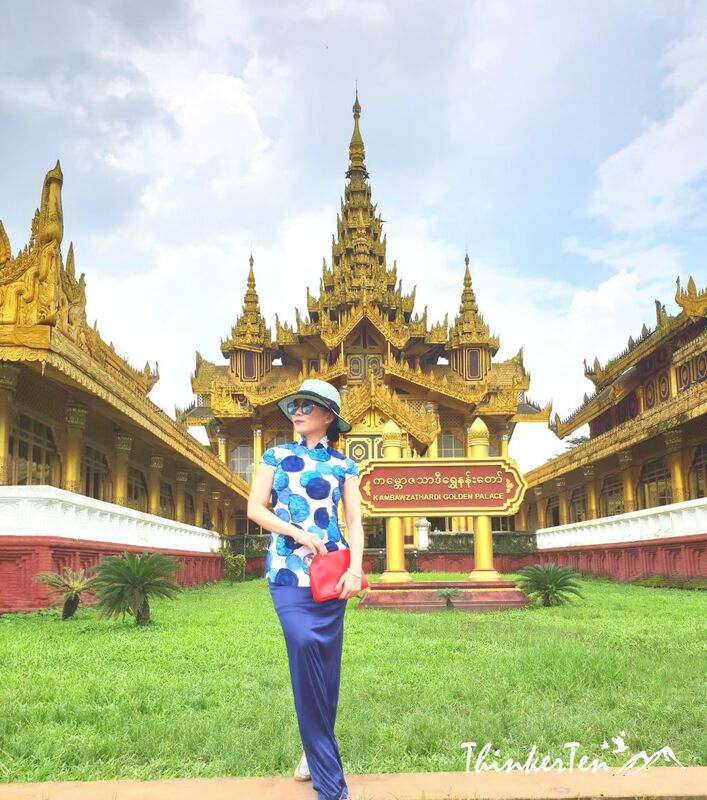 Cities such as Yangon and Bago are safe to travel and full of historical site. What a cool place to visit! There is so much great culture and history to see there. This must have been an amazing trip! What amazing photos. Thank you for sharing your trip with the world! What a fun place to visit. I love all the architechture as it is reflective of the area. Such interesting history. What an amazing place to visit. It looks so full of culture and would be the best place to spend the day with a camera! Such a gorgeous place!! I love that they preserved the teak wood and displayed it alongside the reconstructed beams. Yes, you are right. 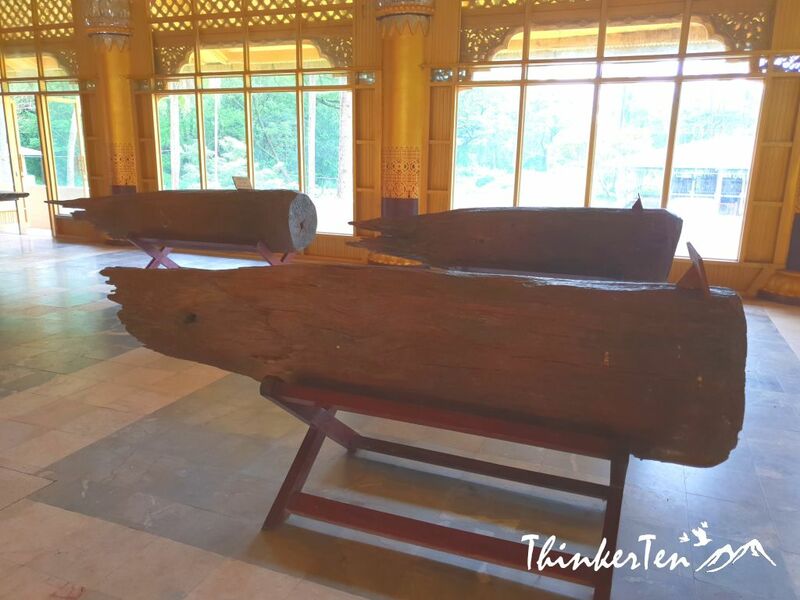 The teak wood is he only original thing left in the Golden Palace. The rest are replica as the Golden Palace was damaged and burnt down many years ago. So do look out for the original of the teak wood displayed, they look pretty old but the part of the wood are still very strong. I would love to visit this palace. Loving the golden architecture here.